One of the most practical aspects of Stephen Covey’s Seven Habits of Highly Effective People is habit 3: Do the most important things first. In this section he describes the distinction between important and urgent tasks. Some tasks are neither urgent nor important, some are urgent but not important, some are important but not urgent, and some are urgent and important (See diagram below). It makes sense that we should avoid and limit the unimportant tasks (quadrants 3 and 4) but the really interesting part is when it comes to the important tasks (quadrants 1 and 2). Spending too much time on the urgent and important tasks can be problematic. People that spend all their time managing crisis or “putting out fires” get burned out and end up reverting to quadrant 4 (not important, not urgent) tasks. 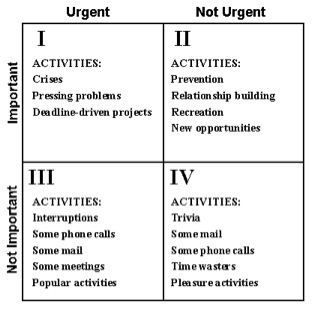 It is better, says Covey, to spend our time in quadrant 2, in the important but not urgent tasks. These are tasks like preparation, planning, maintenance, or “sharpening the axe.” By setting aside time for the important but not urgent we reduce the time we have to spend managing crisis. The problem is that we don’t do these important and not urgent tasks because they aren’t urgent. Urgent tasks get done more readily because they are immediately in front of our face. Important tasks get neglected because they are not. Doing important tasks require discipline and long-term thinking and we put off this hard work because it just doesn’t feel pressing. I’ve been thinking through this concept over the past few days and have been presenting it to people in every area of my life. Here’s how it works out in my various spheres of life. 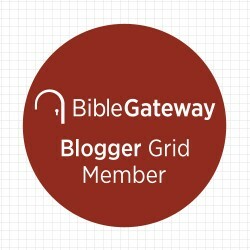 The spiritual disciplines of Bible reading and prayer are quadrant 2 activities. They never feel urgent, but fostering them on a consistent basis will have long-term benefits for our spiritual well-being and will most certainly prevent, or at least reduce, spiritual crisis. Some quadrant 2 activities in family life are spending quality time with your kids and spouse. I think I succeed on the former but fail more often than not on the latter. I would also put family devotions as a quadrant 2 activity. I’m not in school anymore but I had the opportunity to think through this recently with a student. In this setting the exam is the urgent (Cram! Cram! Cram!) and keeping up on homework and reading is the important. I am an engineer and we constantly face this challenge. Urgent tasks always arise – fixing bugs, answering customer questions, finalizing a software release before midnight. Often these urgent tasks drown out the important tasks – writing good requirements and good tests. Perhaps if we put as much urgency on getting the requirements and tests done as we do on getting the software release out the door our software releases would have fewer bugs. Crisis activities come up in church as well. I’ve been challenged recently to work on some quadrant 2 activities here such as more intentional discipleship, relationship building, and gift development of individuals within the congregation, leadership development, and long-term planning and goal setting. I don’t think there’s any way to completely prevent a crisis from happening but you can be prepared for it when it comes. The best way to find out the important but not urgent tasks your missing is to ask and answer the question: What could I be doing (but am not) that would have a huge long-term impact? What Quadrant 2 activities in your life do you need to be doing more of? This entry was posted in Ministry and tagged Christianity, Church, Family, Seven Habits of Highly Effective People, Spiritual Disciplines, Stephen Covey, Time Management on October 20, 2014 by stevenkopp. Over the years I have had to learn that spending time in planning and scheduling is absolutely imperative in ministry. It is the only way that I can really decide what is not important and not urgent.